Man’s Search for Meaning by Viktor Frankl would have to be classed among the most profound works of the twentieth century. A survivor of both Auschwitz and two concentration camps affiliated with Dachau, Frankl — a Jewish Austrian psychiatrist — reflects on his holocaust experience and in the face of it responds to life and its meaning. Frankl lays bare the human condition at its lightest and darkest, best and worst. Boldly speaking about the imperative of life to find meaning, even and especially, in the face of suffering. His experience gives him license to speak rawly about universal and personal truths, lending it something of the prophetic. Despite his own sufferings and ability to maintain a sense of moral integrity during those testing years, he writes honestly, but without resentment against his oppressors, and without taking the moral high ground against those who compromised themselves under the weight of the Nazi jackboot. His sharing challenges our modern sensibilities—pointing out not the demands we should make of life, as we are taught to, but the demand that life makes of us. There is so much one can take from this work, of what is really an introduction to Frankl’s Logotherapy. For a Christian, a Christian reading of the text is inevitable. The mystery of the Logos, the Word, and the Cross, seeps through the words on every page. Through Frankl, the Holy Spirit can help us recapture the true meaning of the Cross in our postmodern landscape where that meaning is all too often deconstructed, institutionalised, privatised and novelised. For the Christian today, faced with the crossless standard of secularism, the Cross runs the risk of becoming nothing more than an identity-concept, an intellectual corner stone, a symbol to muse upon and defend—a point of difference, instead of a reality and mystery to be lived and breathed and believed in. It’s an imperative for every generation and age to rediscover the truths of our faith, particularly the Cross, which always has and forever will run against the grain of the status quo. The Cross will never be cool, and if in certain pockets it ever does become trendy, it could only be a kitsch version of it. It’s a mystery far too great and gritty to be reduced to something bite-sized or to something that merely flashes on a billboard or dangles upon a neck. It will always be more. 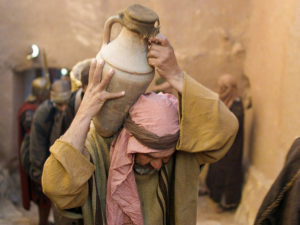 The Wisdom of the Cross speaks uniquely in every age to those with ears to listen (Mt 11:15), but the message remains the same—a call to discover the meaning of life in Christ by shouldering his yoke of love and burden of responsibility. Freedom without responsibility is arbitrary, aimlessly egocentric and condemned to meaninglessness. It’s a license for a self-autonomy void of consideration for the other. It’s the kind of freedom that allows an S.S. soldier to push a woman into a gas chamber. Sure, he might find meaning in doing so, but such subjective meaning is arbitrary, false and without substance. One of the many reasons it is exposed as such is because of its inability to register with universally held human values. Yet what is freedom with responsibility? It is a yielding to the summons of life to be responsible, to take responsibility in the here and now, in fulfillment of one’s vocation. [ii] It demands one’s search for meaning, and one’s execution of their responsibility necessarily supplies it. It is the kind of liberty that rendered the woman being pushed into the gas chamber—St. Edith Stein—free to lay down her life of her own accord (Jn 10:18) despite being forced to die. Sent to the gas chamber but going freely, in her words, “For my people.” It is the kind of freedom that discovers and begets meaning even in situations intended by forces of tyranny to be vacuums of meaninglessness for its victims. There’s certainly a place for Lady Liberty but without Lady Responsibility she is like that personification of folly in the Book of Proverbs, who without the wisdom of responsibility leads men astray after the fancies of their own will, for “her steps follow the path to Sheol, she does not take heed to the path of life; her ways wander aimlessly” or we might say—meaninglessly (Prov 5:5-6). What is this Statue of Responsibility? We all know well what the Statue of Liberty looks like. Yet what might the Statue of Responsibility look like? There can be no doubt about it. The Cross. History has supplied us with the image, and God with its unexpected force of meaning brought about by the Crucifixion of Jesus of Nazareth, the Son of God, who shouldered to the peak of Calvary the responsibility humankind owed to God and to itself. And where humanity failed to shoulder its dual responsibility, the humanity of God Incarnate succeeded. Yet such success was not carried out to deliver us from our responsibilities, but it was carried out to enable us to fulfill them in He who has gone before us—by His strength, His grace and His love. This is not because God is a Father who demands we earn our salvation by the sweat of our brow, but because to exercise our freedom to live responsibly is the only way to enter into this salvation. A salvation from sin, which is our inability to be perfectly responsible on our own, so that we might be enabled free to love—which is freedom to be responsible, to find meaning, purpose and dignity, not just now and in the face of the grave, but hereafter and beyond the grave. Here the promised rest is not a false comfort secured by the abandonment of personal responsibility. It is that peace of heart and mind the world cannot give—infused by Jesus into one’s soul, and which begets a meaning no nail of suffering can destroy. It is the symptom of embracing one’s cross. The vertical beam representing one’s responsibility to God, and the horizontal, one’s responsibility to one’s neighbor. It’s not a cross without both these beams, and Jesus invites—commands even, that we shoulder it. Easy and light? Ridiculous it’d seem. Offensive even. But isn’t that the strange miraculous power of love, that it really is madness to the rational observer, yet pure sense to the one afflicted by it… the one liberated by it? That after all is love—not emotion, but embraced responsibility. He is not saying we deserve or don’t deserve the sufferings we get, but from the Christian angle—the Cross is there, looming large in the midst of our lives—we cannot escape it. Most of the time it makes its presence felt through little things. Yet sometimes the experience of the Cross is deeply felt, and at times it can be experienced as unspeakably terrible, a result of human evil or sickness, in such a way that its reverberations never leave us. Yet whatever form the Cross takes in our lives, it can either be something that crushes and corrupts us with the bitterness of resentment, leading us to lash out at the world with hatred; or a rare and testing opportunity to grow in depth—to be drawn deeper into meaning, into our humanity, and deeper into the Mystery of God who is our Holiness. In other words, the Cross is surely forced on our backs by circumstances we can’t control, but we can decide whether it is an occasion that will crush us and break us, or an opportunity to carry it with Jesus for love of God and man. It’s an ultimatum posed to us by human life itself, and Jesus the Life takes it and eternalises its meaningfulness beyond the human sphere. An ultimatum to choose to be crushed by the cross or to carry it, and our response is up to ourselves as individuals. “Let him deny himself and take up his cross” (Mt 16:24): it’s all in the singular because the proposition is profoundly personal. We cannot judge our neighbours, nor probe their motives, nor are we even capable of discerning the difference between being crushed by the cross and carrying it, for these things can look identical to outward appearance. No, it’s a matter for ourselves to consider, and at most, to invite others into an awareness of this summons. 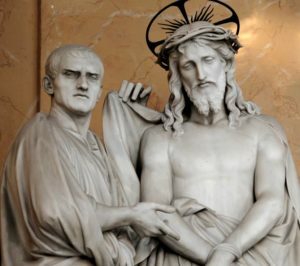 Thus our place is to use our often shoddy discernment not to judge, but to discern how to act as a Simon of Cyrene, instead of a shouting, flagellatory Roman soldier who only makes the crosses of others heavier. 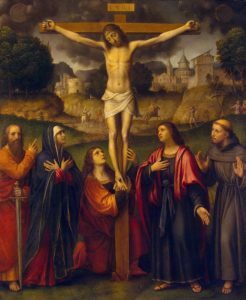 One person may be paralysed and haunted by the profundity of their cross, and it may involve the severest kinds of trauma; or one may be able to meander along under its heaviness, and no doubt life will involve moments of both. Yet whoever we are, whatever our cross, the underlying truth is that to be able to bear and carry the Cross we needn’t be professionals who can run circuits with our cross, but we must simply accept it, even if it takes a while, in the faith that God can use this suffering–big or small–to make us better people, to teach us how to love, to give Him glory, and to help save souls. The option is there, to either suffer meaninglessly in vain or to suffer meaningfully with purpose. To invoke the Name of Jesus is enough to inject our pain with infinite and eternal value. “Man’s inner strength may raise him” indeed. Perhaps in our strength we cannot all rise above our outward fate—prisoners as we are of our own weaknesses. Then on the matter of sin—there is no way anyone can rise above that by their own strength. Just as well. God can achieve all these things, and in Christ Jesus, He has already raised us higher than “man’s inner strength may raise him”. 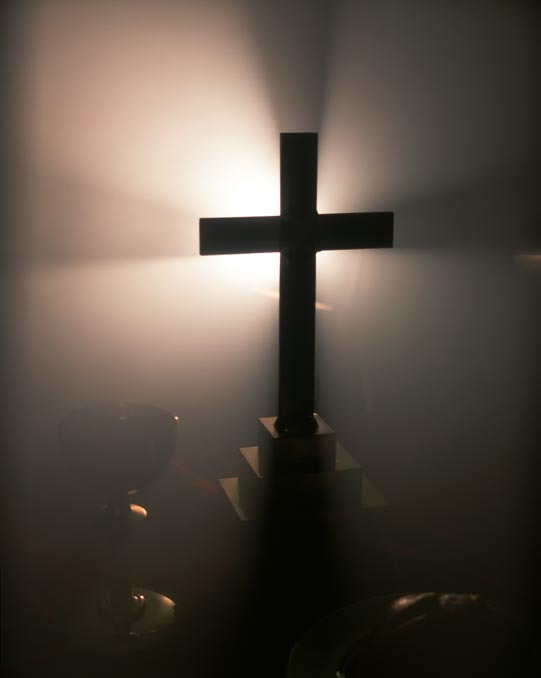 The reality of this resurrection awaits us in our cross: those two beams of responsibility which are far from abstract. For already they weigh upon us and demand our response in the very moment we occupy. We need not search for meaning nor liberty elsewhere. In this respect our Statue of Liberty and Statue of Responsibility are really the same thing, it’s the Cross, through which God in Christ mediates the gift of the liberty of grace through our embrace of responsibility. The Virgin Mary is a testament to this truth. She is the eminent member of our race raised into immaculacy from the moment of Her conception; sanctified, liberated into union with God, from the get-go. She only rose higher with leaps and bounds into this sanctity through Her profound union with Her Son – realised through Her responsibility to God and man, a responsiveness to Him the God-Man. A union made manifest and typified by Her standing by Him at the foot of the Cross—the True Statue of Liberty and Responsibly. Our Lady can thus rightly be called Lady Liberty and Lady Responsibly. For other than Jesus, who else knows better the twin-beams that make up the Cross? That dual responsibility to God and neighbour which crushed Her Heart in a pain worse than death? She was with Jesus in the face of His Cross, and we need Mary in the face of our own. She can teach us how to carry these beams, and calling upon the Name of Mary–confident in, and obedient to the fact that Jesus has given us to Mary, and Mary to us—is enough to realise Her maternal presence and aid already at our disposal. As Lady Responsibly She will help to hold on to the splintery wood of the Cross, in the face of every kind of interior and exterior hardship. As Lady Liberty She will help us to do so with love, peace and even joy. To rest forever after earthly strife. [i] Victor E. Frankl, Man’s Search for Meaning, Part II, 154-155, full text available from archive.org. [ii] Frankl, Man’s Search for Meaning, Part II, 130. [iii] A loose synthesis drawing from Mt 11:28-30; Lk 9:23. [iv] Ibid., Part I, 87. [vi] John Henry Newman, Lead, Kindly Light (1833). Other references, Hamlet, and Phil 3:20.